Joy Creek Photo Archive (c) all rights reserved We grow Chamaecyparis pisifera 'Boulevard' in our Rose and Clematis border where its foliage serves as a back-drop for the pastel pink and blue area. 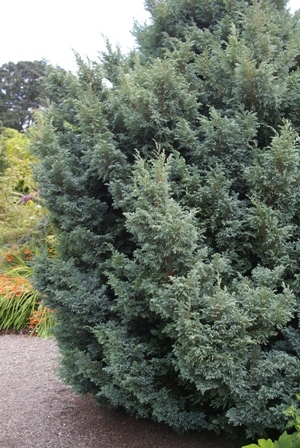 It is a lovely silvery blue, conical-shaped, large shrub or tree. The foliage is soft to the touch. The white reverses of the short needles are visible giving the appearance from afar of a light glazing of snow on the branches. In six years it has grown 10 feet tall and about 8 wide. We grow this in full sun but the foliage can burn if planted in a hot and dry site.